Carefully use clippers or a sharp knife to make a 45-degree angle cut at the bottom of your flower stem. Trim it to the height you need for it to fit well in your vase. Cut your flowers at a few different heights. You will want your tallest flowers to be about 1.5 times as tall as your vase. Use your flower shears or scissors to remove any leaves that will be in the water. If you have a large vase and the flowers aren’t staying in place, cut a piece of floral foam and place it at the bottom. The stems will stick into it and be more stable. Or, wrap a piece of floral tape around the stems to help the flowers stay in place. 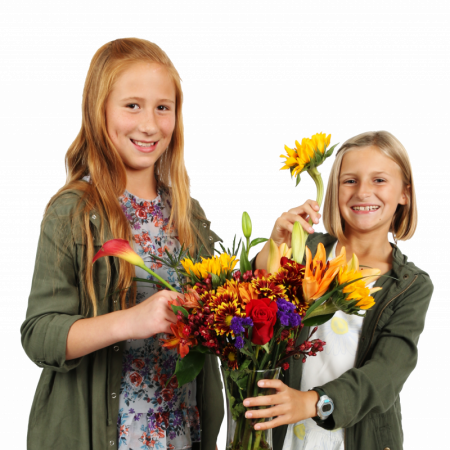 Put the tallest, largest flowers in the back and center of your vase. Add in smaller and shorter flowers around the outside edges and middle of the arrangement. If you want a symmetrical arrangement, place the flowers so the stems get gradually shorter as you work away from the center. Fill in the extra spaces with foliage—green plants like ferns, extra stems, or leaves. Step back from your arrangement from time to time to see if it’s even or if there are any holes to fill.